TEMUCUICUI, Chile, Jan 29 - Chile's Mapuche Indians, the fierce opponents of Spanish conquerors five centuries ago, have renewed their ancestral land demands in a series of clashes with police and private businesses. Groups of the Mapuche, which means "Earth People" in the Mapudungun tongue, have occupied and burned forestry and farming lands in recent weeks and cut off highways to demand territories they say were stolen from them over the past 500 years. One Mapuche student was shot dead in a clash with police in southern Chile earlier this month. His funeral was attended by angry youths bearing long sticks called chueca, a traditional weapon of Chile's largest indigenous group. Faced by mounting protests and a well publicized hunger strike by a jailed indigenous rights activist, Chile's government agreed on Monday to create a high commission for indigenous rights. 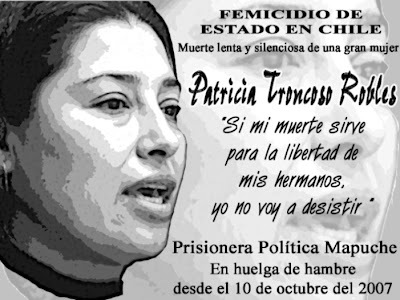 The activist, 38-year-old Patricia Troncoso, then ended the 110-day hunger strike during which she lost 26 kg (57 pounds) and was kept alive by intravenous drip. But the Mapuche want more than a rights commission and are demanding the return of lands taken from them by decrees from the colonial conquests to the 1973-1990 dictatorship of Augusto Pinochet. As Chile's economy booms, they accuse the center-left government of protecting corporate interests and repressing their demands with hard-handed tactics like the ones used by Pinochet's police 20 years ago. "For us there has been no change since democracy started and the military dictatorship ended," said Jorge Huenchullan, a spokesman for the Mapuche in Temucuicui, some 650 kilometers (400 miles) south of the capital Santiago. Temucuicui is a small settlement with only scattered, rustic buildings and a small school, but it is the focal point for a conflict between the Mapuche and police that constantly patrol its forested hillsides and wheat fields. "The biggest (police) raids, the most violent, have occurred during the democracy," Huenchullan said. The Mapuche were famed for their resistance of Spanish conquerors and it was a young Mapuche chief, Lautaro, who captured and executed Pedro de Valdivia, Spain's royal governor of Chile, after the Battle of Tucapel in late 1553. While no one is calling for armed rebellion now, Church leaders and international human rights groups warn the current conflict will escalate unless the government addresses the land issue. "Lets hope the Commission can advance in resolving the fundamental issues of this conflict for Chilean society as a whole," said Bishop Alejandro Goic, president of the Episcopal Conference of the Roman Catholic Church. Marches are planned this week in Santiago to support the Mapuche cause and protest the jailing of four Mapuche activists and Troncoso under a Pinochet-era anti-terrorism law. The five were all sentenced to 10 years in prison in 2002 for setting fire to private lands. The government insists Troncoso and the others jailed with her are not political prisoners, just people who committed crimes when they burned fields and forests, and business groups want a firmer government hand in dealing with the protests. "This cannot be tolerated and the government must enforce the law. The guilty must be punished by the justice system," said Fernando Leniz, president of Corma, an industry group of Chile's major forestry companies. In Temucuicui, where police patrol an area that is home to 120 Mapuche families laying claim to 600 hectares of lands, local leaders call the forestry companies "colonists," like the ones who took their lands five centuries ago. "The colonists must go, there is no other way," said Huenchullan, the Mapuche spokesman. "We are going to defend our Mapuche rights on the lands that belong to us ... We are decided and will not cede ground."